There’s no question that the iPhone X is better than its predecessors in every way, and that includes battery life even though the phone isn’t physically as big as Plus model iPhones. Of course, you can never have enough battery life so it’s still a good idea to pick up a battery case to ensure you can make it through even the busiest of days. 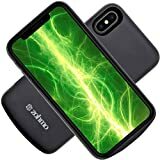 Instead of spending $50 or $60 on a case, check out the Zohmo Slim iPhone X Battery Case. It has just as much capacity as pricier models, but it only costs $21.99 on Amazon.